I am on both sides of the copyright issue. On one side I am a rights manager. On the other I am a user of works that are or were under copyright or are protected by common law. As my mother's executor, I am managing copyrights for her published writing that expire in 2056, rights to her unpublished writing, copyrights to her published illustrations that expire in 2076, and rights to her unpublished art. I am approached by museums to allow reproduction of my mother's art, by publishers who want to reprint her books, and by movie-makers seeking to turn books into television shows or movies. As a publisher, I need to protect the intellectual property that I publish while making sure that we don't infringe on the rights of others. 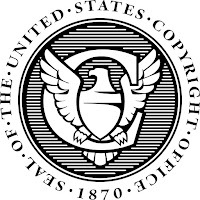 In its most general sense, a fair use is any copying of copyrighted material done for a limited and “transformative” purpose, such as to comment upon, criticize, or parody a copyrighted work. Such uses can be done without permission from the copyright owner. Source: What Is Fair Use? - Copyright Overview by Rich Stim. Increasingly, I am getting into the habit of checking on the "Visit Page" option when I look up Images on Google, and only using an image when there is no copyright attached or a liberal policy of fair use is announced or implied. I seek to acknowledge sources for every image I use as well as quotes or paraphrases. Recently I came across a summary of the basics of copyright law as applied to photos that I found useful. What goes on in the real world is that there is a lot of appropriating of other people's work in the name of commentary and hommage. If the system is to work, we need a higher level of understanding of and compliance with the law. It doesn't help, however, that copyright law is so complicated. 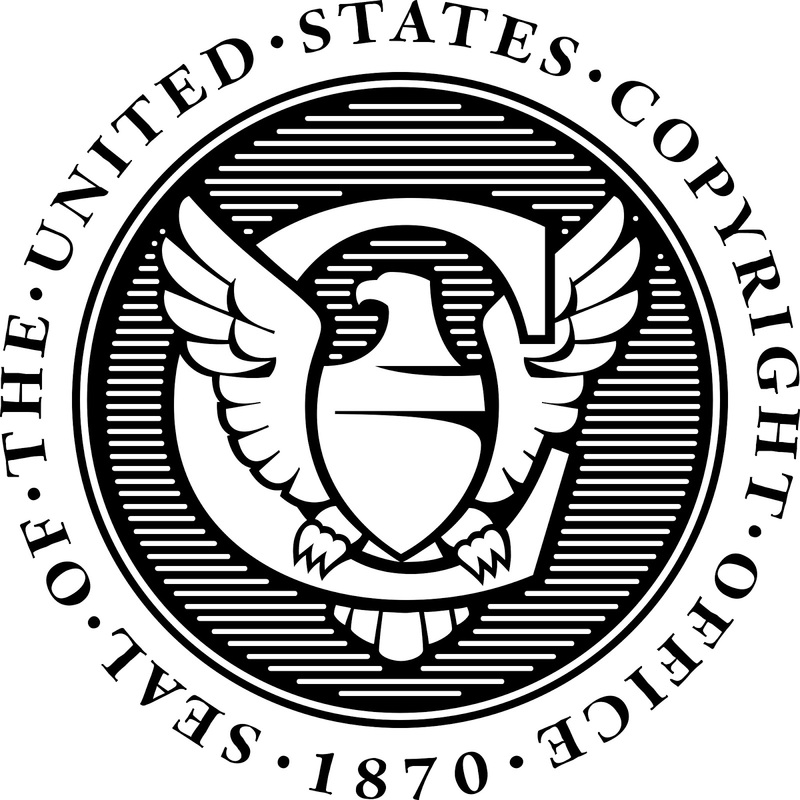 Here are the basics from the Copyright Office. If you know of other good sources, please comment. 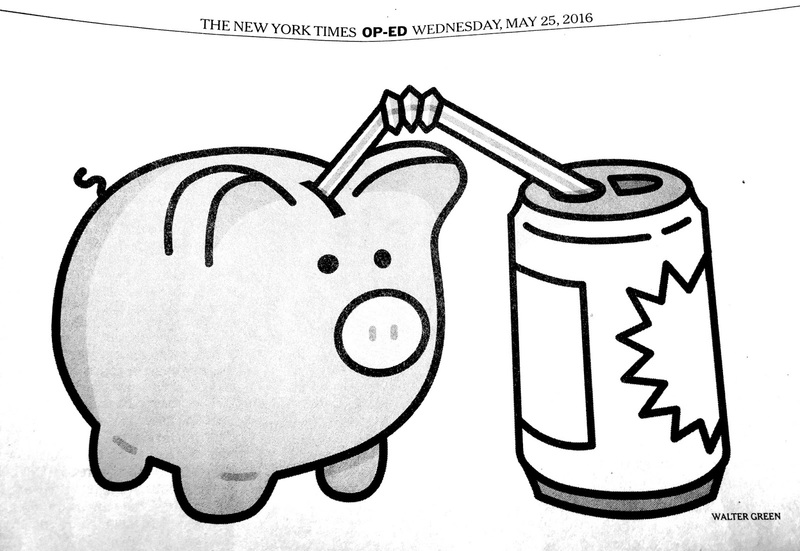 An Op-Ed by Mark Bittman, who co-founded The Purple Carrot and is a Fellow with the Union of Concerned Scientists, argues that the Berkeley, Calif. popular vote (3 to 1) to tax sugary soda drinks is the wave of the future. Four other cities in Northern California are also considering such a tax, including the biggest, San Francisco. Bernie Sanders opposes such taxes on grocery items because he says they are regressive, i.e., their burden falls on the poor more than the rich. That is so, not only because poor people spend more of their income on groceries, but also because they are less educated and don't realize how bad for their health is a large intake of sugary drinks. All the more reason why this tax is especially important for poor people. Mayor Jim Kenney faces Bernie Sanders' concern about the regressive nature of soda taxes. He is pledging the revenue from the new tax to fund community amenities, especially those for children–universal pre-kindergarten (Head Start for All), community schools, libraries and parks. So it is win-win for the poor. Either they continue buying the unhealthy soft drinks and support their community projects, or they give up buying the sugared drinks (Pepsi and Coke are offering many alternatives) and they reduce the demand for health care services. So far I have mostly just summarized Bittman's essay. Let me say that I think Bittman is right on this issue. While Bernie Sanders is on target with many of his financial proposals, he is I think wrong on the question of taxing sugary soda. 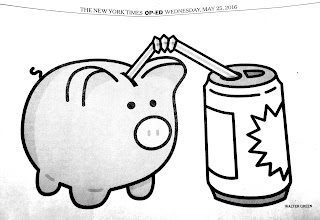 The illustration to Bittman's essay, of a soda can siphoning into a piggy bank is apt on its own, and is doubly apt when we consider that it is a PIGou Tax. A tax on things raises their price and reduces their consumption. If the items are potentially socially deleterious, like gambling, tobacco and alcohol, then reducing their usage is a good thing. A Pigou Tax, named after British academic Arthur Cecil Pigou, is one that falls on socially undesirable goods. FDR quickly understood that it was better to permit alcohol and get revenue from it through a "sin tax" than to continue to try to prohibit it. photos by JT Marlin, taken with permission of the artists. May 23, 2016–I was alerted by a friend, Ellen Rautenberg, that an unusual show was on its way to Ashawagh Hall in Springs, the hamlet northeast of East Hampton, N.Y.
Ashawagh Hall uses the old native-American term for a place where roads come together. It's where Old Stone Highway from Amagansett meets Springs Fireplace Road from the village of East Hampton. It's also where the 92nd Street Y in New York meets East Hampton. If the art work on the walls at this exhibit could talk about the experiences incorporated in them, we would get an earful. 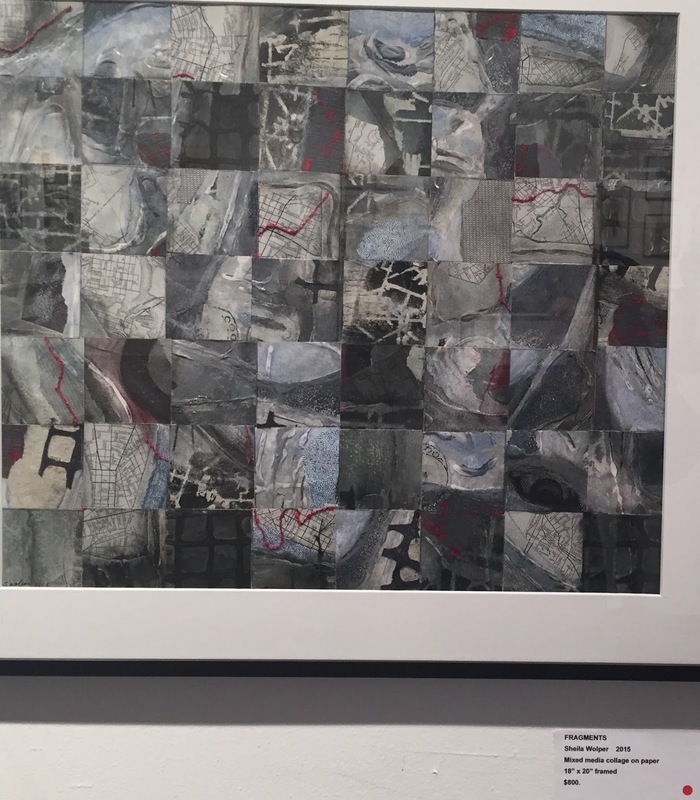 The nine women exhibiting have put mixed media to work sending messages. These mature women put the challenges, tribulations and joys of their lives into their art. Some of the themes were challenging. What do we make of the various objects selected to surround a human face or faces? What messages are we supposed to get, and how does that differ in some cases from the messages we are actually getting getting? First, I will pick out a few of the artists, and then I will make a general comment on the overall effect of the exhibit and make some notes on the contradictory pressures faced by artists. There is a strong unity to the show provided by the idea of these women creating art as their next act, better than the one(s) before. The show is titled "nextactART". If you want to reach the artists, their gmail address is the title of their show. I have earned my living as an economist, so my interest in art starts with the marketplace. How is art sold? Why do people buy it? What is the purpose of galleries and exhibitions? Why do some artists get more for their work? When I go to Ashawagh Hall shows, as I have for 35 years, these questions pique me. Being able to create art that sells is not for everyone. If you are obsessed with painting things that people don't get joy looking at, no one can say you are wrong or are necessarily a bad artist. And, who knows, you may be able to change public opinion. Think of what E. B. White did to rehabilitate spiders in the face of widespread arachnophobia. Think of what the moneyed buyers of the art of Jackson Pollock (who lived and painted a short walk up the road from Ashawagh Hall) did, after many years, to silence scoffers at his paint-throwing artistry. Some well-off artists trade purchases of one another's art. Maybe it is unfair because it depends on who you know. But if friends won't buy your art, who in the heartless world beyond can be relied on to do so? Vincent van Gogh's art-dealer brother bought all the art that Vincent produced. It wasn't charity; it was an investment. How much Theo was willing to pay his brother for his art materials and other expenses established enough of a value to enable his painting. Here are three artists that were selling for good prices at Ashawagh Hall. 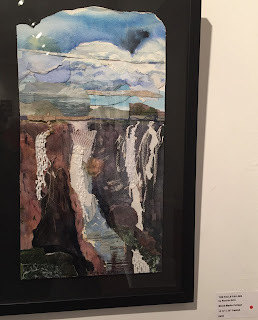 This is, incredibly, Sheila Wolper's first show, and she took in $3,400 for three works of collage art. The art work that leads off this post above was Enigma (2015), commanding $1,800. The red dot was there on the first day. I would call Enigma a "Face-Plus" collage. The idea seems to be that you put a face on the canvas board or whatever and you surround it with images–in this case, hints of the men and women in the person's life, fantasies, aspirations and the large mixed textures of daily life. This Face+ approach of putting a face amidst associated images is used elsewhere in the show. It's a truly brilliant way of starting an art career, because each art work is different but organizes itself. All of these Face+ artworks are connected by the common thread of an easily understood set of rules of the game. What was Gilbert Stuart's Lansdowne portrait of George Washington if not the General surrounded by objects that were meaningful to him, like the inkwell featuring his coat of arms? Two other collages by Wolper are more like puzzles. They sold for $800 each. Fragments (2015) above has pieces of maps and photographs cut up into an 8x7 checkerboard with enough information to connect each square with another one. It's like a CrossPic puzzle, something to hang in a waiting room to keep clients occupied while they wait to be called. The nine artists have clearly been prepped to prepared a promotional sheet and business card announcing their status as artists. 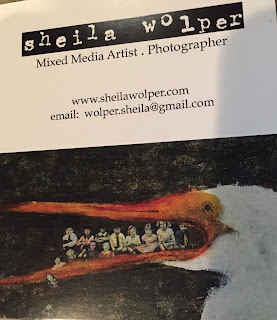 Wolper's card is appealing. On one side of her card is a collage called Transport, a large stork bringing children. The tragedy is that the stork has so many children to carry that at first sight a couple of them are falling off at the front end. But no, those are faces of older people. Are young people pushing out older ones? Is the message that the planet can't carry us all? Whoever buys the painting presumably will have the last word on how to interpret it, unless Sheila Wolper goes public with her intent. My late mother, Hilda van Stockum, who made a good living during her long life as an artist and illustrator, several times refused to sell a painting to someone who wanted to buy it for the wrong reasons. For example, she wouldn't sell a portrait of one of her children because the wannabe buyer said it reminded him of someone else. But by and large, if someone buys a painting, they have bought the right to decide what the art means, unless the artist contradicts them. Judy Taylor is another artist who sold several of her art works at the show. I mentioned that she achieved an impressively deep black background on her collages and I promised to explain it. The aluminum may dent if dropped. Someone has to be hired to produce the final products for sale. You have to find this person. Taylor found someone in a photo shop who moonlights doing these sublimations. If it costs $100 per piece of art (an educated guess), one-third of the $300 for this collage goes to producing the final item for sale. This piece of art was one of a set of eight. So if it cost $100 per item to produce, the artist has to lay out $800. Judy Taylor writes on her collages. That breaks down the silos of writing and art. It's one of the short-cuts available in collage–if the message isn't coming across right, just write it on the piece of art. 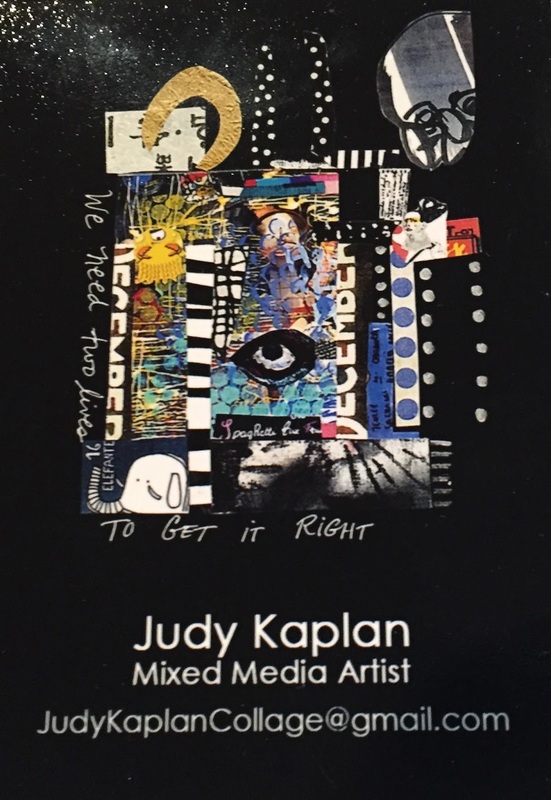 Taylor's artist's card says: "We need two lives to get it right." That seems to be a reference to F. Scott Fitzgerald and the feasibility of second acts. People think Fitzgerald said there are no second acts but in fact he argued against that statement. 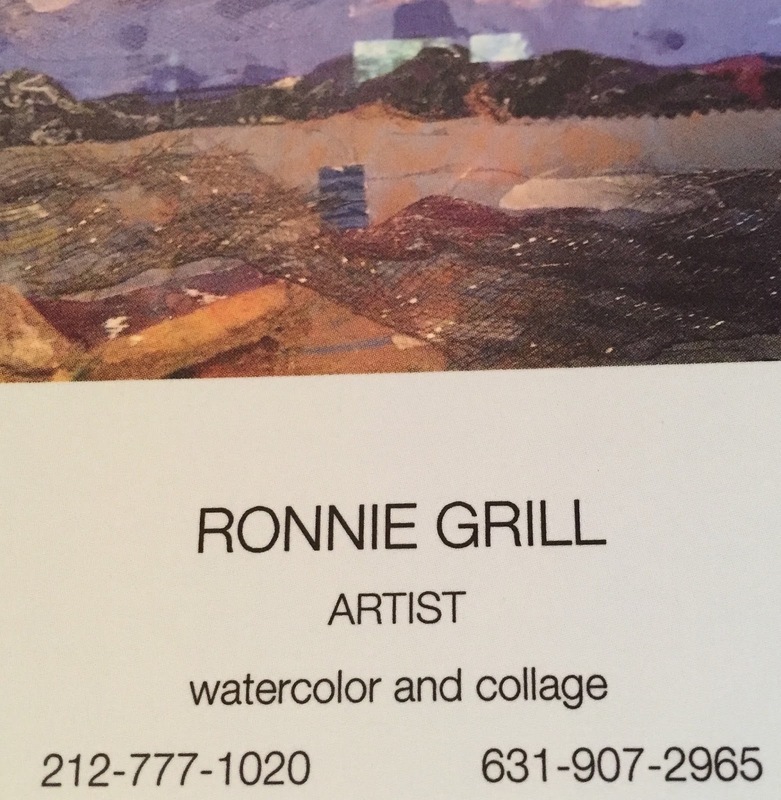 Ronnie Grill's artist's card has a 631 number on it, which suggests she is the local connection for the NYC artists. She does interesting things photographically and also does traditional collages. Grill is the only one in the show with art work that is traditionally shown in Ashawagh Hall, i.e., scenes of bays and rivers. 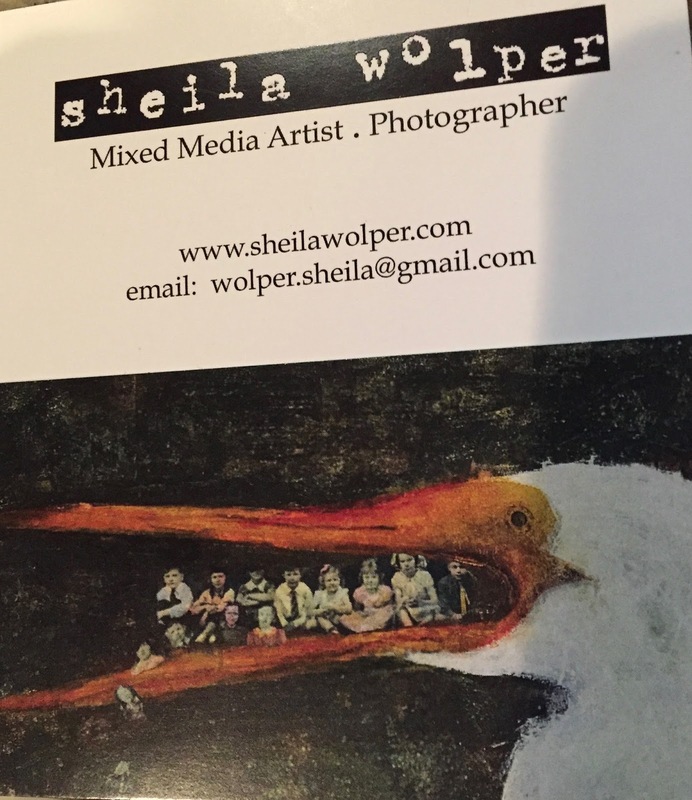 Her Napeague scene is on the front of her artist card at right and her Falling Falls is below. The Napeague scene features fishermen's nets. The falls scene features shredded paper to indicate a waterfall. It's an eye-catcher from across the room. 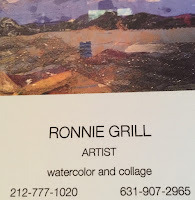 Ronnie Grill, The Falling Falls. 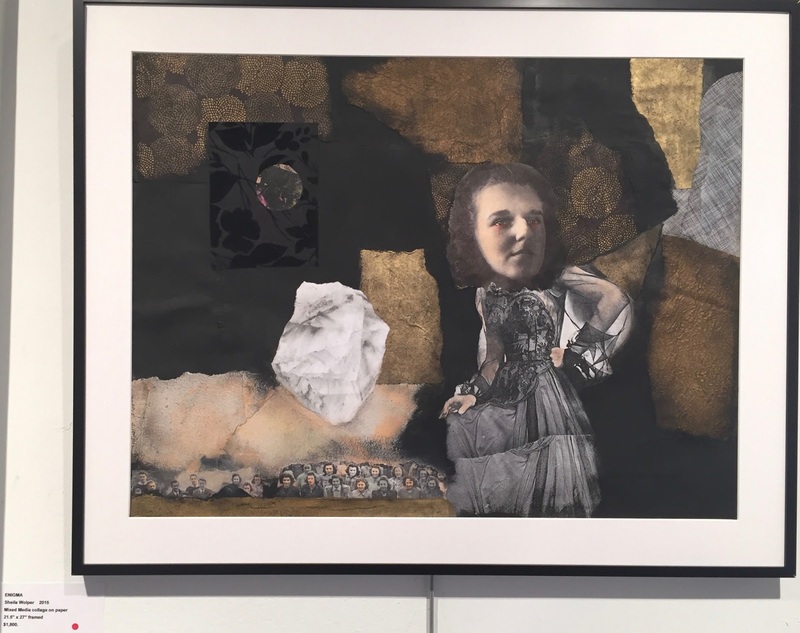 The other six artists at the exhibit were Stephanie Suskin with multi-media sculptures, Barbara Brier, Rena Diana, Patricia Miller, Maddie Goldman with hanging sculptures, and Madeline Farr with groups of people with an international flavor. 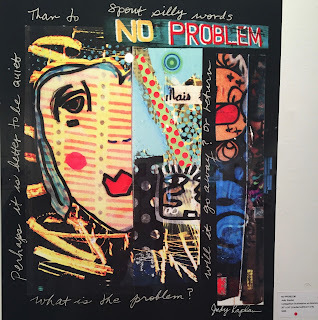 The nine exhibitors met through an art class for collage credit at the 92 Street Y. I promised to provide a couple of clues to what they teach in these courses. One of the guidelines is that the paper quality used in collages must be archival – no one wants to see their expensive collage artwork start to yellow after a few years. Glue is important and Weldbond was recommended for most things, although it depends on what is being glued. 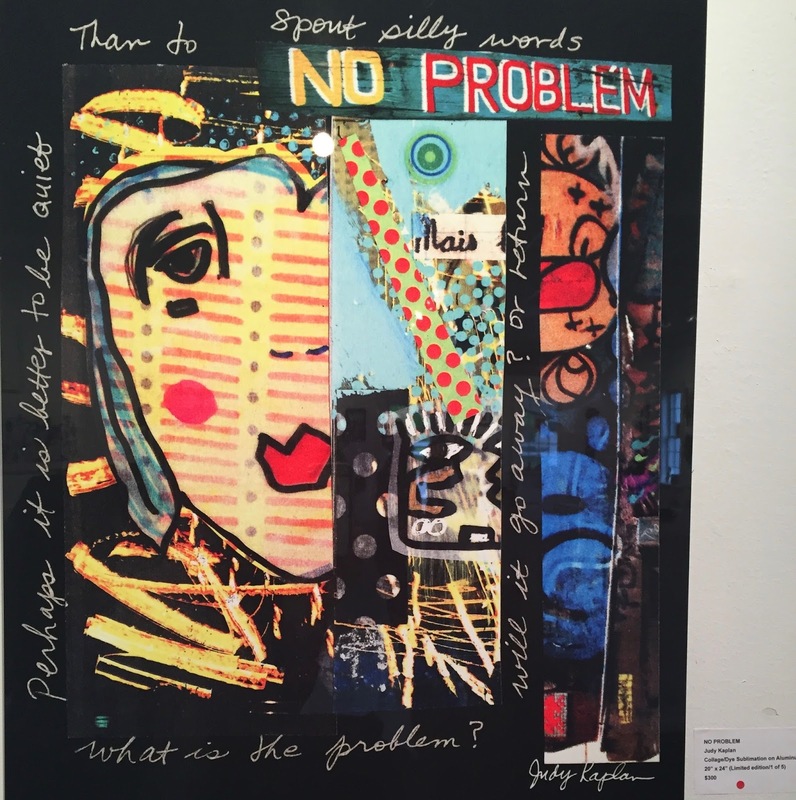 Based on attendance at the show, interest in the collagists' art work, and sales of art, the exhibit was a success. The show was thought-provoking, even overwhelming. A couple of artists I spoke with at the show said they found that the intensity of the messages was deafening. How does one deal with that problem? I have a thought on this. I talked with Wolper, who was I think the star of the show, especially because she is such a newbie. As I said to her, one way to deal with the possible noisiness of collage art is for artists to explore a kind of collage and then move on. The voices of that period of one's work then become contained by markers at the beginning and end of the period. There is also commercial value to defining one's work by a period. My mother said of Picasso that he was a good artist but a commercial genius, because by exploring a kind of art and then moving on, he created scarcity for the art of each of his artistic lives. 16 years later. That's more than one-fourth of its value in real dollars, not counting fees and commissions. The power of 100 of the world’s top companies. The power of a proven 15-year track record. The index fund is PowerShares QQQ, an Exchange Traded Fund (ETF) based on the Nasdaq-100 Index. Yes, the NASDAQ-100 index does include many large companies, starting with Apple. If we had invested $4,691.61 in the NASDAQ-100 on that March 2000 day, then 16 years and seven weeks later the investment would be worth $4,342.81 at the close of business yesterday. That's a loss of $348.80 or 7.4 percent, not counting any broker/manager carrying and trading fees, pricing spreads and commissions. So much for the "track record". 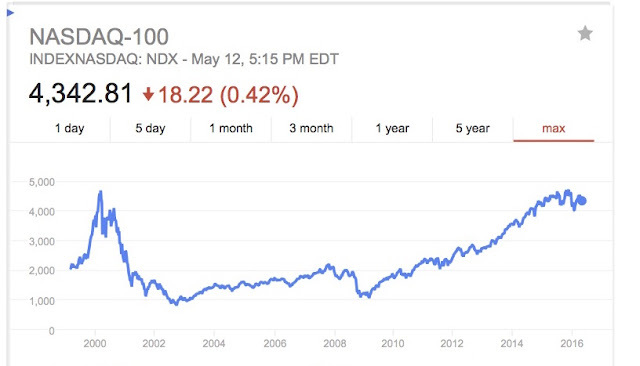 A negative nominal return over 16 years. How bad is the return adjusted for the rise in the cost of living during this period? 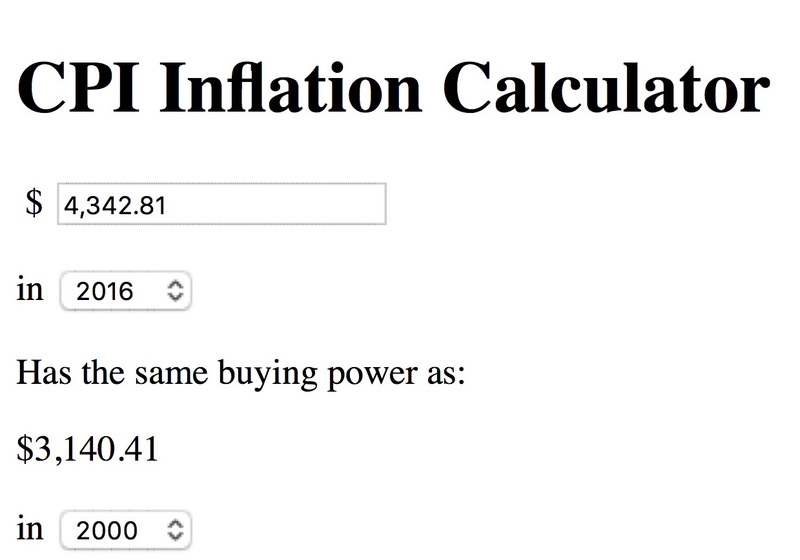 Adjusted for the cost of living, $4,342.81 in 2016 is equivalent to $3,140.41 in 2000. So the real loss over 16 years 2000-2016 is $4,343-$3,140=$1,203. In percentage terms, the real loss is $1,203/$4,692=25.6 percent. That's an average annual loss of 1.6 percent over 16 years. Leonard Mancusi of Woodmere died at 71 of natural causes. Born in the Bronx, he grew up in Queens, graduated from Iona College with a BS in accounting and an MBA in organizational behavior. He then received his JD degree from New York Law School. Prior to beginning his long career in government, Mancusi joined the audit staff of Pannell, Kerr, Forster and Co., an international CPA firm. Upon receiving his MBA he began his career in government, first as Secretary to the New York City Planning Commissioner in Economic Development Administration and then as a Special Assistant to the Commissioner in the Environmental Protection Administration. In 1974 he joined the New York City Comptroller's Office and during the next 16 years served as Special Assistant Deputy Comptroller, Special Assistant to the Comptroller for Risk Management and Assistant Comptroller for Administration. In 1990 Mancusi was appointed New York City Deputy Fire Commissioner and in 1994 he returned to the Comptroller's office where he was appointed New York City Senior Assistant Comptroller. As an attorney, Mr. Mancusi served as an Adjunct Professor at the Graduate School of Business Administration of Long Island University and as an Adjunct Professor of Law, Real Estate and Insurance at Mercy College. He also served 15 years as a volunteer arbitrator in the New York City Civil Court. His community activities included serving on an advisory panel at Yale University Medical School Department of Epidemiology and Public Health, executive secretary of the National Council of Columbia Associations in Civil Service, President of the Columbia Association of the Comptroller's Office, Vice President of the American Society of the Italian Legions of Merit, Vice President of the Coalition of Italian American Associations. He was also on the Board of Directors of the America-Israel Friendship League, the Catholic Migration and Refugee Office of the Brooklyn Diocese and the Italian Heritage and Culture Committee of New York, and the Italian Apostolate Advisory Committee, He was also a member of the ltalian-American Labor Council. Len has also been a member of the Per Sempre Lodge 2344 Order Sons of Italy in American in Lynbrook for 38 years. He served as corresponding secretary and was on the commission of social justice advisory committee. In 1988 the President of ltaly, Francisco Cossiga bestowed the rank of Cavaliere (knight) in the Order of Merit of the Republic of Italy for his dedication to the ltalian-American community. On June 2 1993, Italian President Scalfaro elevated him to the rank of Cavaliere Ufficiale: and on May 12, 1995 the Ambassador to the United States presented him with Italy's Distinguished Service Award. On October 1, 1994 John Cardinal O'Connor invested him as a Knight of the Equestrian Order of the Holy Sepulcher of Jerusalem and was elevated to the rank of Knight Commander in September 1999. Len is survived by his wife Mildred, daughter Stephanie and her husband Andrew DeCicco and their children Samantha, Kristen, Michael and Matthew. He is also survived by his sister Elisabeth Mullen. General Theological Center, 20th-21st Streets. All photos by Alice Tepper Marlin. Alta Linea is open for the summer season in Chelsea. 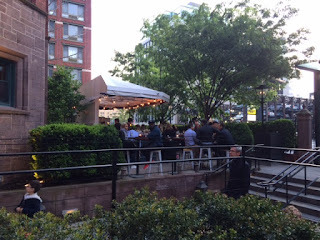 It is just east of the High Line after which it is named. An online pronouncing dictionary says the second word in the name in Italian should be pronounced LEAN-eh-ya. The anglicized LIN-eh-ya is also used. Alice gave me a report on her first visit. She said Alta Linea is child-, dog- and diner-friendly. Just a few days after reopening (it is closed during the winter), it is getting a regular crowd again. But dogs should not expect a seat at the table (in the lap is okay). Yesterday (Saturday) a standard poodle was seen dining or at least standing by. in a plastic cup. They also have dog dishes. 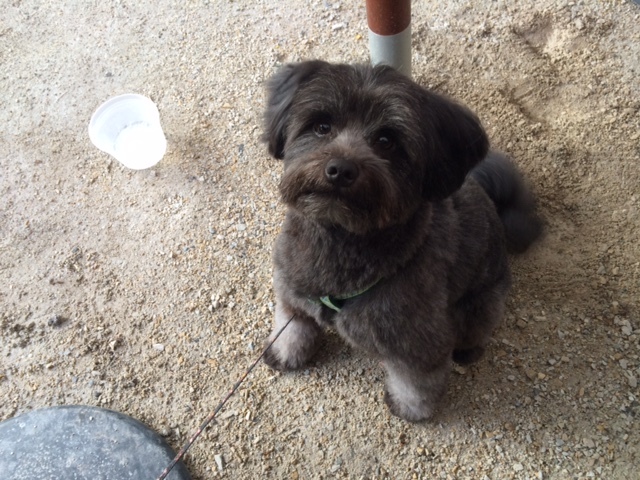 Not to mention our Schnauzer-Wookie mix Hachiko, seen here with a plastic cup of water. There is a good dog dish with water out front but Hachiko wanted his own. It was perfectly toasted, ricotta amazingly light, cut with honey so also sweet. The lightest, most delicate grouper I have ever eaten. Delicious sauce, asparagus and morel mushrooms with it. The sauce so yummy that I asked for more bread to soak up every bit of it, very French. I never much liked rice pudding but this one was amazing! On a bed of delicate rice pudding was a delightful assortment of very special fruits and nuts. Heavenly! Wine selection leans toward Italian with some New World labels. Hard to choose because there are so many good ones. 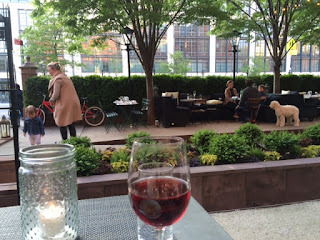 Alice said she had a light northern Italian red, perfect with the meal. Alice, Hachiko and I went again for dinner. It opens at 5 pm but we went late. The place was packed. We shared artichokes to start; yum. Alice and I each had a grouper and loved it again, and cleaned the plate. We shared the rice pudding dessert and I have to say it is everything Alice said about it, outstanding. Next time we will try some different things. Meanwhile we know there are things to eat there that we are unlikely to get tired of. cigs so I can always have a stick in my mouth too?" The U.S. Food and Drug Administration (FDA) has announced it will extend its regulation of tobacco products. It will go beyond cigarettes and smokeless tobacco, to include e-cigs, cigars, hookah tobacco and pipe tobacco. Now, what about products that train young people to smoke, like candy cigs? 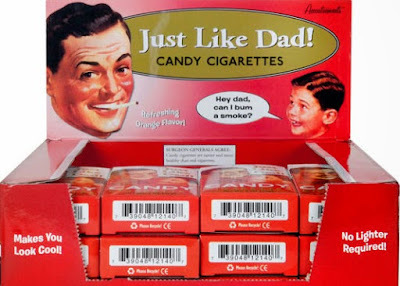 I have sounded off on the Federal case against candy cigs.